San Diego's scenic Embarcadero is the essence of the city. San Diego is a city of different flavors and topography. But it is, first and foremost, a waterfront city. And what better way to take in the essence of the city than to do a waterfront San Diego walking tour? The skyline, saltwater, gentle breeze and colorful sights all lend to a leisurely and interesting walk along the central part of San Diego Bay. Probably the easiest place to begin your self-guided walking tour is at the foot of Broadway, at the Broadway Pier. A pay parking lot is located a block away, as well as numerous coin meter spaces along Harbor Drive. For those taking public transit, the San Diego Trolley stops at the Santa Fe Railroad Station a couple of blocks away. For those staying in downtown hotels, the Broadway Pier is a short walk away. Walking north past the harbor tours, you will approach the Cruise Ship Terminal, where the massive international cruise ships make their ports o' call to San Diego, perhaps one will be in port during your tour. As you continue walking you'll approach Anthony's Fish Grotto restaurant, a San Diego institution. The dockside building actually also has an informal take out counter as well as the semi-formal and pricier Star of the Sea Room. Just past Anthony's is the majestic Star of India, a historic, tall-masted iron ship which dates back to 1863. This national historic landmark is the world's oldest ship still seaworthy and makes a sea journey at least once a year. In this area of the Embarcadero are the three other ships which comprise the San Diego Maritime Museum: the Berkeley, a Victorian-era ferryboat; the Medea, a 1904 steam yacht; and the Pilot, a 1914 guide boat. A nominal admission fee is required to board the boats. At this point, if you look across the bay, you'll see the North Island Naval Air Station, where the U.S. Navy ports its large aircraft carriers and fighter jets. Looking back across Harbor Drive, you'll see the historic County Administration Building. You'll also notice pleasure craft sailing on the bay. As you walk south from Broadway Pier, you'll approach Navy Pier, where Navy ships often dock and conduct free tours for the public. Navy Pier is also the new museum home of the aircraft carrier, Midway. As you continue walking, you'll pass several Navy buildings. Continue on and you'll approach several small green spaces, as well as the popular Fish Market Restaurant. You might want to take a short break and grab a drink and snack and enjoy the scenic view. Although no longer, this area of the waterfront not long ago used to be the home of one of the largest tuna fleets in the world. Most commercial ships are gone, but you can still feel the aura of the old fishermen. Heading farther south, you'll head toward Seaport Village, a popular shopping and dining complex on the waterfront. Here you can browse the dozens of shops, take a ride on the carousel, or just watch the people around you. 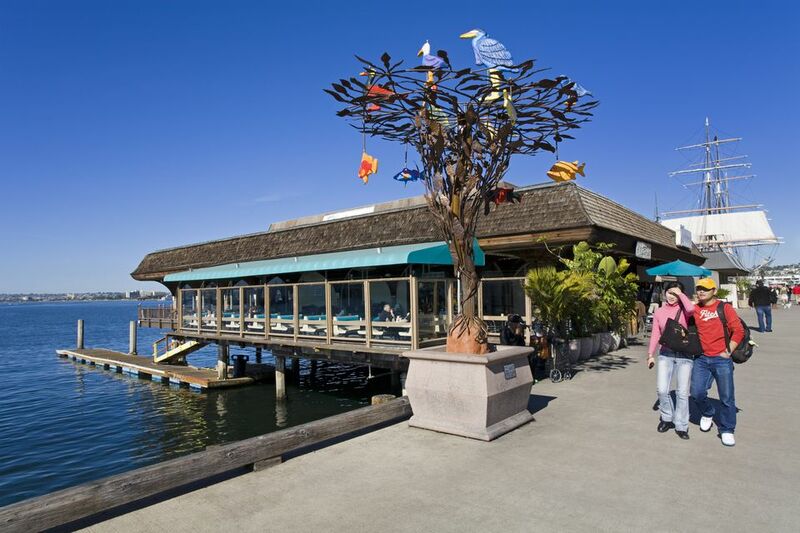 Seaport Village is also a perfect spot to grab a relaxing meal from a number of fine restaurants and food stands, including the Harbor House Restaurant. After your meal, head to the adjacent Embarcadero Marina Park where you can enjoy the open green space, views of Coronado across the bay and the yacht marina of the neighboring Hyatt and Marriott towers. Just a short walk past the two hotels, you'll find the San Diego Convention Center, with its distinctive "sail" rooftop. From here you'll probably want to head back to Broadway Pier -- you can either catch the Trolley in front of the Convention Center in downtown San Diego and head back to the Santa Fe depot, or if you still are in the mood, stroll back along the waterfront of San Diego on foot and take in the soothing views one more time.